Life has always been a great struggle for Ratna Bhondve currently aged 70 years; a fatal childhood accident got her handicapped by both legs, at a very young age. Her husband heartlessly left her within few weeks of marriage as he didn’t want to bear her responsibility. Ratna tried forgetting her pain by finding happiness in helping other people and raising neighbors’ kids as she didn’t have her own. In 2003 life again took a cruel turn and Ratna while crossing a road in Mumbai met with a serious accident leaving her leg broken from hip in 3 places and was completely bed ridden for almost 2 years. Currently her condition keeps getting uncertain and requires regular medical and nursing attention (last she was majorly hospitalized for more than a 1 month in 2015).She also suffers from severe mental trauma. Since last 14 years Ratna has not left her house due to her condition and burdened with huge medical expenses. Currently she doesn’t have any support and her younger sister is finding it very difficult to make ends meet as she doesn’t have any source of income due to old age. 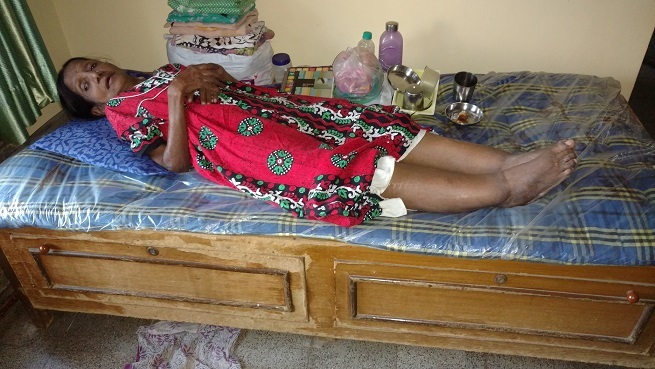 Please help Ratna as her growing age has aggravated her unfortunate condition and she requires higher medical as well as nursing attention. Also support is required for her to lead respectful life. Thank you for your help. Your share could be as good as a donation for Chanda Bhondve! Not everyone can afford to take care of their loved ones. Chanda Bhondve's life can only be saved by donations made by kind people like you.